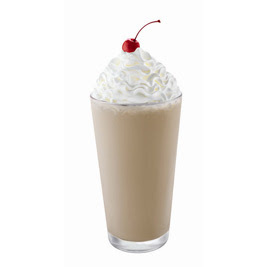 So my husband and I have been on a recent "milkshake kick," which is odd since it's the middle of winter here. But nevertheless, they are fun to make, and oh so delish to drink. 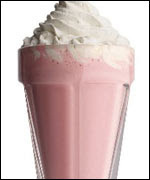 I prefer chocolate mint, whereas he's a berry guy and loves the strawberry shake. I blame this new obsession partly on the fact that I recently inherited my Grandma's old blender. I saw this recipe on Rachael Ray's 30-minute meals and I knew I HAD to try it. It's not every day that I watch the Food Network and come across a meal that I feel I actually have the time and the skills to make, so I always jump at the chance when I find one. I love meat, I love cheese, and the tomato gravy is a fantastic compliment. Try it and be prepared to say "YUM!" Place meat in a mixing bowl and season with salt, pepper, add in garlic, eggs, cheese, bread crumbs and sage. 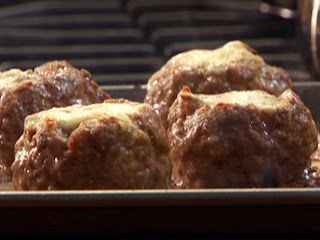 Mix meat, roll into 8 large balls and arrange in a baking dish. Coat balls with 2 tablespoons extra-virgin olive oil. Using the end of a wooden spoon, make an indentation half way into each ball and fill the cavity with some Gorgonzola. Bake until golden and cooked through, 15 to 20 minutes. Heat 1 tablespoon extra-virgin olive oil and butter in a sauce pot over medium heat, add bay and onions and season with salt and pepper. Add chicken stock and tomatoes and heat through, stir in cream, reduce heat to medium-low and simmer to thicken slightly 8 to 10 minutes. Ladle sauce into shallow bowls and top with big stuffed meatballs. I got this recipe out of an old Taste of Home magazine. While I've made meatloaf for years, something wasn't turning out right as of late, so I thought I'd actually try a recipe for once! Some people may not be huge fans of meatloaf, but I can honestly tell you this one was OUTSTANDING. So much flavor, the bread crumbs really held everything together, and we were able to eat several meals of leftovers. I'm tellin ya...give this one a try. In a bowl, combine the first eight ingredients. Crumble beef over mixture and mix well. Press into a greased 9-in. x 5-in. loaf pan. Bake at 350° for 1 hour. Spread with ketchup; bake 15-20 minutes longer or until a meat thermometer reads 160° and meat is no longer pink. Let stand for 10 minutes before slicing. 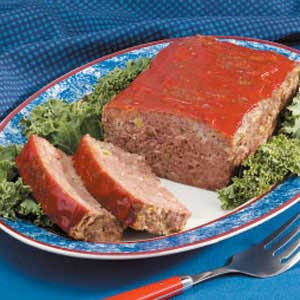 Meat loaf may be frozen for up to 3 months. Yield: 8 servings. stop by and tell me who you are! I'm just AMAZED at all the hits I'm getting on this blog a day...I'm talking in the hundreds. And it's so weird how many of you are coming from all over the world. How are you finding my blog? Are you googling certain recipes? Please leave me a comment, let me know how you got here and where you're from! I'd love to know!